Dankie Marinda. Julle gee `n wonderlike diens....Dankie. I am so impressed with the way MyRoof works. I received 12 offers on my property already. MyRoof does not charge any commission to sell your property online. 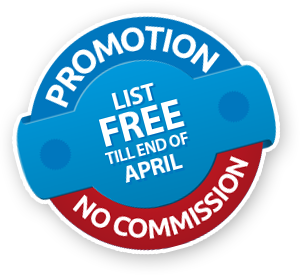 What we mean with no commission is exactly that – no fees are ever payable to us at any stage for the FREE listing option. As we do not charge commission, you can accept a lower offer but still get the same amount of money in your pocket. This will result in more interested buyers in your property. All privately owned properties on our website have floor plans in the main centers. Just imagine if you were a buyer and could get an idea of the layout of a property even before visiting the home! Not only will the buyer get an idea of how big the property is, but he or she will also get the chance to view the sizes of the individual rooms and see where they might want to add or remove a wall. The buyer will also have the opportunity to compare the sizes and asking prices of different properties per square meter. Lastly, the floor plan gives the prospective buyer a clear understanding of how the property looks as the arrows on the floor plan show from which angle each photo was taken. The buyer now gets a real feel for the property and can immediately see if this is what they were looking for. This means that only serious buyers will make offers on your property. On top of the unlimited photos and the added floor plan, we also offer you a large client base where alerts are sent out to buyers who are looking for a property like yours. Alerts are sent to prospective buyers who have indicated that they are interested in property in a specific area at a specific price range. Alerts will also be sent out should you lower your asking price or arrange a show day with us. This has been found to work well to communicate with many potential buyers at once. And it also keeps buyers interested in your property! We will keep your property on our website until the day it is sold – whether this will take a day or a year. MyRoof has hundreds of thousands of property buyers and send out tens of thousands of alerts daily to keep these buyers updated on new properties they might be interested in buying. Don’t worry if you’ve heard that selling your property is difficult because you are in our capable hands – this is what we do, all day, every day. Our system has been proven to work by many satisfied sellers like you – all of this at no cost to you! MyRoof offers the complete online experience for buyers. How do we do it? With our front page displays, many photos of your property, detailed floor plans, MyRoof For Sale board, MyRoof On Show boards and alerts we send out to our large data base. If you combine this with our world-wide marketing resulting in thousands of online offers on a daily basis, you know your property transaction is in good hands. I have accepted an offer, but where to from here?